Historic Naval Ships Visitors Guide - USS Joseph P. Kennedy Jr.
At: Bethlehem Steel Company, Quincy, Massachusetts. Armament: four 5-inch/38 caliber guns; ten 21-inch, Mk 32 torpedo tubes; depth charges; Anti-Submarine Rocket (ASROC); Drone Anti-Submarine Helicopter (DASH). 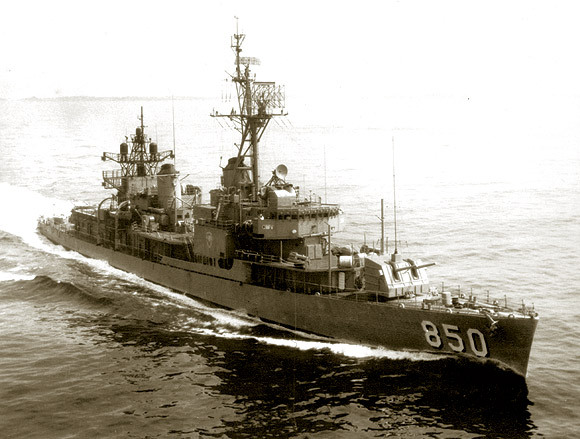 Destroyer Joseph P. Kennedy, Jr. was named after President Kennedy's older brother who died during a top-secret airplane mission over Europe in World War II. In 1946, another Kennedy brother, Robert, served as a radarman on board Kennedy, and the new destroyer spent the rest of the decade conducting training exercises in the Atlantic and Caribbean, and executing peacekeeping duties as a member of the Sixth Fleet in the Mediterranean. On February 3, 1951, she joined the carrier task force attacking North Korean positions. In May of that year she stood off Wonsan, North Korea, using her 5" guns for nearly a month of continuous bombardment duty. Kennedy left the war zone and arrived back in the States in August 1951, and for the next several years she completed several Sixth Fleet tours of duty, midshipmen cruises, and joint NATO maneuvers. In early 1961 she operated in the Caribbean, assisting with the first Mercury space flight's recovery efforts. 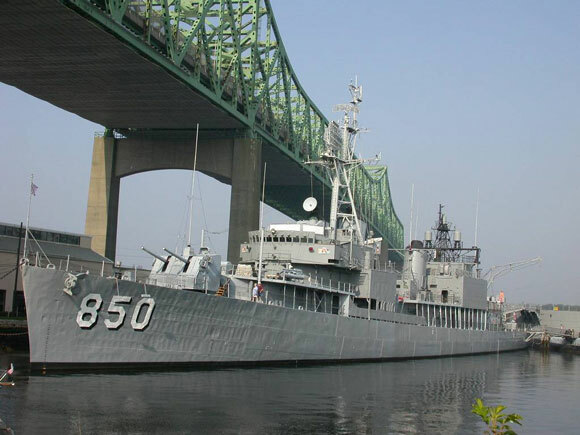 She arrived at New York Naval Shipyard in July for renovation under the FRAM I (Fleet Rehabilitation and Modernization) program. This conversion afforded her new anti-submarine gear, a helicopter hangar and flight deck, and other improvements designed to extend her useful life. Following a post-refit shakedown cruise, she returned to Newport, RI, in September 1962 to embark President John F. Kennedy for his observation of that year's America's Cup Races. In October Kennedy was dispatched to the Caribbean to participate in the naval blockade of Cuba. It was here on October 26 that Kennedy stopped and boarded the Soviet-chartered freighter Marucla, suspected of ferrying missile components to Cuba. From the early 1960s until her decommissioning in 1973, Kennedy again performed innumerable duties. She was stricken from the Naval Register of Ships in 1973 and acquired by Battleship Cove in 1974. Home to the Admiral Arleigh Burke National Destroyermen's Museum, U.S.S. Joseph P. Kennedy, Jr. is one of five National Historic Landmarks on exhibit at Battleship Cove, the world's largest collection of historic naval ships. U.S.S. Joseph P. Kennedy, Jr. serves as the official memorial to Massachusetts citizens who gave their lives during the Korean and Vietnam Wars.